In 2003, she fetched the Film fare Best Actress award for her performance in the Tamil film 'Pithamagan', opposite Vikram. After the success of 'Pithamagan', she took a break and went back to Mumbai. But she returned to the silver screen with 'Ullam Ketkume'(2005), in which she did an innocent, tomboy kind of character. Another noted film was 'Kanda Naal Mudhal' (2005), a Prakashraj production, in which she delivered a matured performance. Her first Telugu film was 'Egire Pavuramma' with Srikanth and JD Chakravarthy. Her career failed to take off in the Telugu Film Industry. Films like 'Subhalekhalu' and 'Ugadi' only added to her woes. 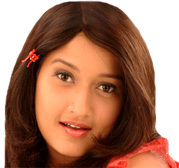 This bubbly girl has also done films in Kannada. She did the female lead in the Upendra starrer 'Thande thakka Makka', remake of the Tamil original 'Thevar Magan'. Her Malayalam films lists include 'Itha Oru Snehagatha', 'War and Love' (2003), 'Swapnakoodu' (2003-Guest role), 'Mahasamudram' (2006) etc. She got married to Mehdi, an Iranian businessman based in Mumbai, on January 6th 2006 and has decided to continue acting in films. Laila has captivated the hearts of movie goers with her natural beauty, dimpled smile, chirpy presence and effervescent acting style. This down to earth gorgeous girl believes that the glitter of the film world does not last forever.